The hero of the Infinity Blade series never really dies. Each time he falls he is reborn, accruing skill and power until he's an unstoppable force. The same could be said for the series itself. The first Infinity Blade was presented as a demonstration of the graphical prowess of Epic's Unreal Engine 3 on the iPhone and iPod. It was a pretty face with some cool ideas, but not much personality or depth. 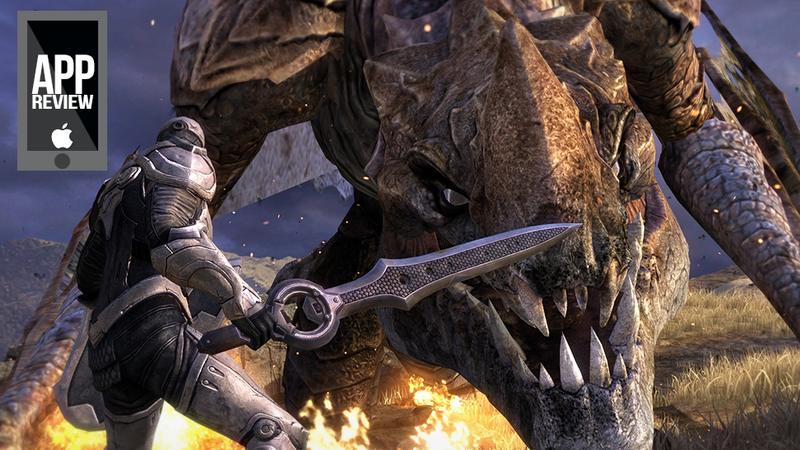 Infinity Blade II was where the series really came to life. Fully-voiced characters, a gem aumentation system for weapons, and a strong story bolstered by a novel from fantasy author Brandon Sanderson (Infinity Blade: Awakening), it felt more like a real game than a centerpiece. To be honest, I didn't play Infinity Blade II when it first came out, expecting the same experience as the first game. I only caught up with it recently, and I've been kicking myself for holding out for so long. Despite still basically being a series of one-on-one swipe-based battles interrupted by poking about the screen for hidden treasures, suddenly there was a real weight and sense of history to the game world. With a strong foundation set by the second game and another Sanderson novel (Infinity Blade: Redemption) leading up to it, Infinity Blade III hones the franchise's formula to a fine point, bringing a grand story that didn't feel like it was all there in the first game to a close. Yes, there is a lot of swiping. Attacking, dodging, parrying, casting magical spells, exploring exotic fantasy locations and hunting for hidden treasures with simple swipes and taps of the touchscreen are all hallmarks of the series. They're all here, and they're all working wonderfully. In fact, there's even more swiping, now that the game's hero, Siris, has been joined by a second character — the rogue Isa, finally in playable form. Between the two of them there are six unique fighting styles to master, including sword and shield and the other ones (I have a preference). Each character's weapons and equipment are unique, so fans of the game's collecting element will be in hog heaven here. Equipment still gains experience, bestowing skill points to its wielders upon mastery. Skill-enhancing gems, introduced in the second game, are back and more effective than ever. Both of these aspects of the game are further bolstered by NPCs in the Hideout, the game's new central hub. Isa and Siris are deployed on their missions, side-missions and challenges here, while new non-player characters — the weapon-enhancing blacksmith, gem-splicing gemcutter and the mechanical potionmaster — eventually set up shop, adding a little crafting magic to the game. There's even a shady merchant who shows up now and again, hawking limited-time wares. Leveling up Siris (and Isa) has gotten a much-needed shot in the arm via skill perks, special abilities and benefits which are unlocked when a certain number of skill points are assigned a stat. Putting points into strength might make a character more powerful, but a few points in Isa's magic stat unlocks the Lockpick ability, giving the characters even more access to the branching paths of the game's gorgeous grottos, dungeons and ruins. The battling itself is still fresh and entertaining. New enemies with new attacks will keep the most devoted fans of the series on their toes, while the ability to drop back to a lower level instances of a particular mission will keep novice players from getting too discouraged from seeing the adventure through. Oh, and this guy shows up now and then. He seems nice. With unlockable branching paths in each of the game's massive new levels, hundreds of weapons to customize and master, things to wear, potions to brew, and a wide variety of strange and wonderful creatures lining up to kill your characters, Infinity Blade III has a great deal to offer, and that's not even figuring in future updates and the global social ClashMob events, which I was unfortunately unable to test. Infinity Blade III is still a showcase of the graphical power achievable on iOS devices with Unreal Engine 3 — that's how they keep getting up on stage at Apple events, after all. It's also much more than that. It's the glorious final step in the evolution of the series that taught us mobile gaming didn't just have to be able flinging birds and matching gems.